But there are other thoughts on the zashiki-warashi. In the 42nd year of Meiji, Yanagita wrote in his diary that on the journey from Hanamaki to Tono he saw only three places that showed any sign of human habitation. On these rough plateaus between the surrounding mountains it was said there were a hardscrabble people making their living off the land called Yamabito. These people of the mountains were said to be of substantial build and were described as having eyes differently colored from normal Japanese. The villages of the Tono area were terrified of Yamabito, who were said to sometimes raid the villages and either ravage or kidnap the local women. Due to this fear of outsiders, as well as due to the special geographical features of the mountain basin in which they lived, the people of Tono were solitary and exclusionary. Their houses held many secrets. Old families of rank and reputation sometimes found their daughters ravaged and impregnated by these Yamabito attacks, and any child born of such a union was hidden away in the depths of the family mansion and never allowed to see the daylight. Other families of lesser fortunes sometimes gave birth to more children than they could afford, so it was said that some children were culled, their bodies buried under the dirt floors or under the kitchen instead of a proper grave. An eyewitness to both of these ancient customs sites these practices as the origin of the zashiki-warashi legends. Regardless of their origins, they are a vivid and ancient legend. One official account, published in 1910 (the 43rd year of Meiji), tells of an elementary school in Tsuchibuchi where a first grade student claimed to see a zashiki-warashi right in front of him, although his teachers and classmates were unable to see the spirit. Trackback: 10 Crazy Japanese Superstitions they believed | BLOG DAILY! TELL OTHERS! GET PAID! Subscribe for Free! Just enter your email address, click I Love Kaidan and start getting translated Kaidan by mail! What Does Yokai Mean in English? What is the Triangle Headband Japanese Ghosts Wear? How Do You Say Ghost in Japanese? 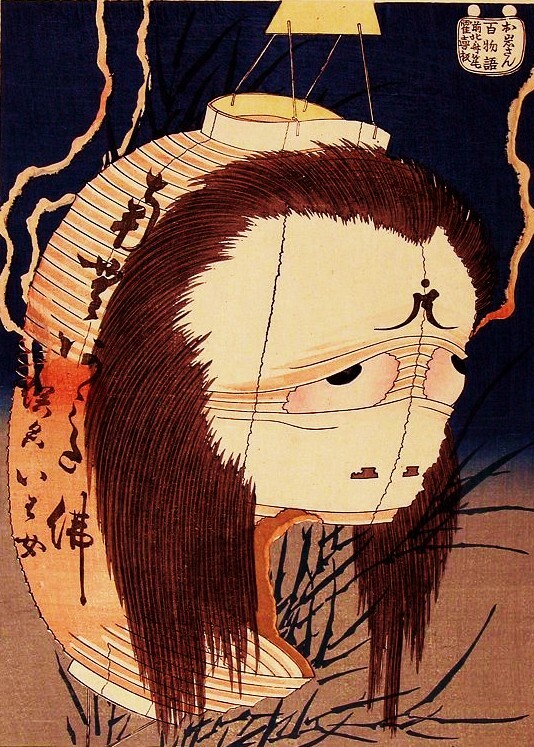 What’s the Difference Between Yurei and Yokai? [Genrespezial] J-Horror: Der Geist in der japanischen Filmkultur | Infernal Cinematic Affairs on What is the White Kimono Japanese Ghosts Wear? [Genrespezial] J-Horror: Der Geist in der japanischen Filmkultur | Infernal Cinematic Affairs on What’s the Difference Between Yurei and Yokai? In Asian Spaces on What is the Triangle Headband Japanese Ghosts Wear? Big Sale on Yurei: The Japanese Ghost !!! Happy 93rd Birthday Mizuki Shigeru!!! Happy 92nd Birthday Shigeru Mizuki!!! All translations and other writing on this website were created by Zack Davisson and are copyright to him. No part of this web site may be reproduced or transmitted in any form or by any means, electronic, mechanical, photocopying, recording or otherwise, without prior permission of Zack Davisson.